Its like she's a girl AND my ambiguously gay life partner, score! 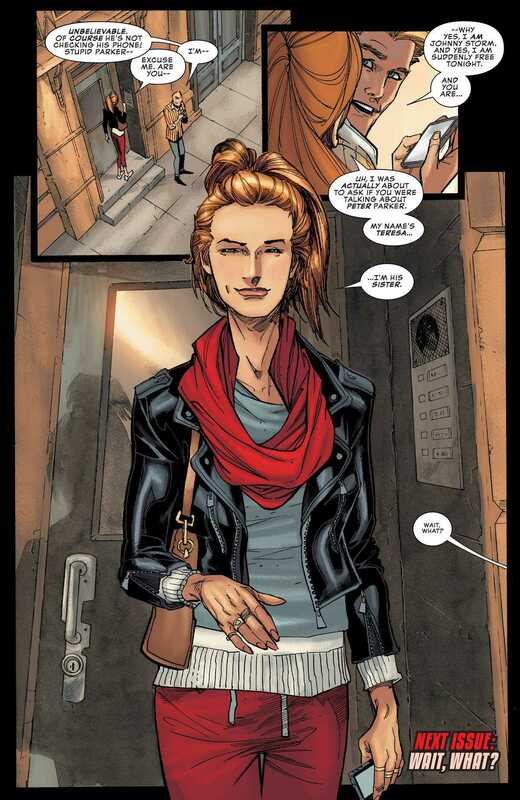 Johnny Storm dates supermodels and royalty, but show him a modestly-dressed woman who looks like a female Peter Parker and he's immediately smitten. No subtext here! lol reminds me of the bit in USM when he hits on Jessica Drew not knowing she's a female clone of Peter. I'm also reminded of the time Kate asked Clint if he wanted to sleep with Spider-Man and he said "No-I-Because that screws it up, it ALWAYS screws it up. I always screw it up and-and-"
I thought Johnny was confirmed as canonically bisexual? Did I hear wrong? More of a longtime fan speculation thing. Still, I think there's more evidence for the HT being bi than there ever was for Iceman being gay. In light of this, Ultimate Spider-Woman, and his long history with Spidey, I like the idea of Johnny being in love with Peter but we know that's never going to be followed up on. ..actually Marjorie Liu said that Johnny slept with Daken in her run on Dark Wolverine. It's not just fandom speculation. That makes him word of god canon queer. Johnny's also on panel mentioned dating a nonbinary alien which is pretty concrete evidence for his bisexuality. The next issue begins with Johnny Storm, lying crumpled in a heap on the floor, after his brain's short-circuited trying to figure out whether Peter having a sister is his dream come true or not. All joking aside, it'd be interesting to see where this goes. Are they following up on that one OGN I heard about? Yeah some pages from Spider-Man Family Business were posted earlier, the post should still be on the front page. Is it just me or is there something wrong with Kubert's art? It doesn't look right. I feel like this is an idea I'm supposed to hate, but I really don't. I'm curious to see where they're going with it. I'm not a huge fan of the continuity this is referencing, but I'm willing to give it a bit of a chance, given that Zdarksy is a very competent writer in spite of what his own public persona would suggest.